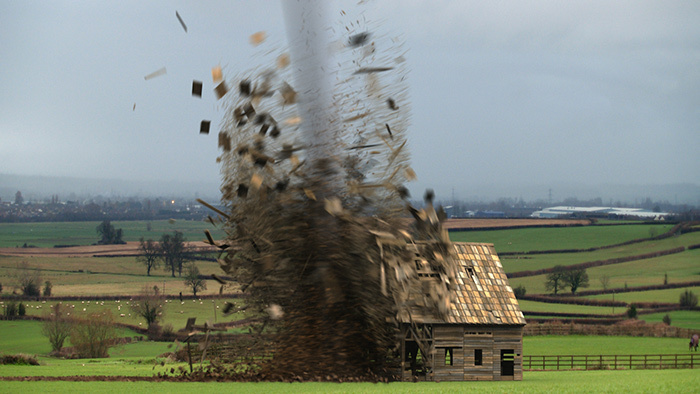 A tornado is a violently spinning column of air extending from a thunderstorm down to the ground. It often, but not always, has the shape of a funnel. Tornado intensity is typically classified according to the Enhanced Fujita Scale, which measures the strength and estimates the wind speeds of a tornado based on the damage it produces. The ratings range from 0 through 5. If you live in an area where powerful storms are common, it would be wise to take practical steps to prepare for severe weather. Have a family tornado plan in place, know where you can take shelter quickly, and practice a tornado drill at least once a year. Store protective coverings, such as mattresses, sleeping bags, and thick blankets, in or near your shelter space to help protect you and your family from falling or flying objects. Consider buying a NOAA Weather Radio (NWR) All Hazards receiver, which receives broadcast alerts directly from the National Weather Service. A tornado watch means that tornadoes are possible in a particular area. When a tornado watch is issued, make sure all your safety supplies are handy. Turn on local TV or radio, or NOAA Weather Radio, and stay alert for warnings. Be sure you are close enough to a shelter or sturdy building to get there quickly in a few minutes if there is an official tornado warning or if you see signs of a tornado. A tornado warning means that a tornado has been sighted or indicated by weather radar. If a warning is issued for your area, take shelter immediately. Safety steps during a tornado depend on the type of structure and situation. In most cases, the safest structure is a “safe room” built specifically to withstand a tornado. Here are tips for other structures and situations. In all structures, remember to move away from windows and do not open any windows. House with a basement — Go to the basement and, if possible, crouch under some form of sturdy protection such as a heavy table or work bench, or cover yourself with a mattress or sleeping bag. Protective headgear such as a helmet might also offer some protection. Know where heavy objects, such as refrigerators or pianos, are located on the floor above and avoid the space below them. House with no basement or an apartment — Go to the lowest floor, a small center room (like a bathroom or closet), under a stairwell, or in an interior hallway with no windows. Crouch as low as possible to the floor, facing down, and cover your head with your hands. A bathtub may offer some protection. Even in an interior room, you should cover yourself with thick padding to protect against falling debris. Mobile home — Get out! Even if your home is tied down, it is not as safe as an underground shelter or permanent, sturdy building. Most tornadoes can destroy even tied-down mobile homes. If possible, go to a shelter or a nearby permanent structure. Multistory building — Go directly to an enclosed, windowless area in the center of the building on the lowest floor possible. Crouch down and cover your head. Interior stairwells are usually good places to take shelter and, if not crowded, allow you to get to a lower level quickly. Stay out of elevators; you could be trapped if the power is lost. Car or truck — If the tornado is visible and far away, and traffic is light, you may be able to drive out of its path by moving at right angles to the tornado. Seek shelter in a sturdy building or underground. If this is not possible and you are caught by extreme winds or flying debris, park the car as quickly and safely as possible out of traffic lanes. Stay in the car with the seat belt on. Crouch or lie so your head is below the windows; cover your head with your hands and a blanket, coat, or other cushion if available. Outdoors — If possible, seek shelter in a sturdy building. If not, lie flat and face down on low ground, protecting the back of your head with your hands. Get as far away from trees and cars as you can. Standard homeowners policies typically cover damage to a home’s structure and contents caused by a tornado, up to policy limits. They may also pay for living expenses such as hotel bills and meals if you can’t live in your home while it is being repaired or rebuilt. Be sure to review your coverage periodically and make sure that the cost to rebuild the structure and replace all of your belongings would not exceed the limits of your policy.